This recording presents a feast of Celtic harp music and a well-deserved tribute to Anne Macdearmid. Here fifteen of her duets — and a few carefully chosen solos for variety’s sake — have been brought together in one programme. The arrangements are played on two concert harps. Anne herself agreed wholeheartedly to this choice of instruments. In her own words: “play it on any type of harp: big, medium or small, as long as the melody sings”. The internationally acclaimed singer/harper Anne Macdearmid has arranged countless traditional melodies from Scotland, Ireland and Wales for voice and harp, for clarsach solo (“clarsach” being the Gaelic word for the small, diatonic blade harp) and for two Celtic (or pedal) harps. On this recording fifteen of her duets — and a few carefully chosen solos for variety’s sake — have been brought together in one programme. The arrangements are played on two concert harps. Anne herself agreed wholeheartedly to this choice of instruments. In her own words: “play it on any type of harp: big, medium or small, as long as the melody sings”. 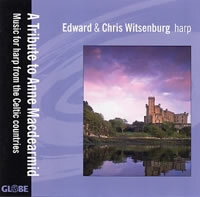 This recording presents a feast of Celtic harp music and a well-deserved tribute to Anne Macdearmid. 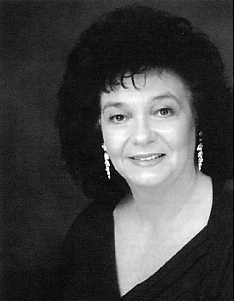 Anne Macdearmid was born and educated in Aberdeen, Scotland and first studied classical harp with Sanchia Pielou at the Royal Scottish Academy of Music and graduated in singing, harp and piano. Later she found that her true love was the clarsach (the small Celtic harp), both as a solo and accompanying instrument. Combining this with her singing, she has presented countless recitals and workshops all over the world. She was Head of Music at Aberdeen Grammar School for 17 years and also conducted numerous courses, in particular the Heritage of Scotland Clarsach Summer School for 25 years in Edinburgh with students coming from Europe and the United States. Another of her talents being for composing and arranging, Anne has published 11 books which are in constant demand by players and teachers because of the musical and imaginative presentation. Throughout history music has played a major role in the life of the Celts. They have been characterized, for example, as “music makers and dreamers of dreams”. The innate love of beauty is an essential element of the Celtic soul. Often both a sadness and a restlessness can be found in their songs, reflecting the mysterious, rhythmical, relentless pulse of the sea, especially in the melodies of the inhabitants of the islands (like the Hebrideans). The ever-present wind has also had an influence. Nature has clearly put a stamp on their music. These orally passed-on melodies are usually termed folk-music. The Scots, Irish and Welsh possess a wealth of poignantly beautiful traditional airs. Moreover for many centuries the harp has played an essential part in the music of the Celts, especially as the most appropriate instrument to accompany song. That tradition continues to this very day. An Droighnean Donn (The Blackthorn Bush). This tune appears in Edward Bunting’s “General Collection of Ancient Irish Music” (1796). A love song in which the singer says: “My love is like the blossom of the sloe that grows on the blackthorn bush”. The Banks of the Suir. The Suir is a river in the Republic of Ireland. It flows from Clonmel through Carrick-on-Suir and on to Wesford. Mulhaire's, Molly Bawn and The Green Mountain. Three lively traditional Irish reels (a quick, indigenous and probably very ancient dance). A simple, slow and wistful tune. Translated into English the first stanza runs as follows: “At the seashore are red roses, At the seashore are white lilies, At the seashore is my beloved, who sleeps at night and rises in the morning”. Helar ysgyl’arnog (Hunting the Hare) conjures up a jolly hunt on a fine day, of dogs chasing a hare, but not catching it. Bugeilio'r Gwenith Gwyn (Watching the Wheat) is a melancholy love song. Pant conan yr wyn (The Lambsfold Vale) depicts the Welsh countryside with gambolling lambs. Also known under the English title: Strike the Harp. Mnathan a Ghlinne Sèo (Women of the Glen). A traditional Highland melody. Alternatively known as “The Piper’s Warning”, supposedly played by the Campbell piper just before the impending massacre of the Glencoe MacDonalds (1692). Chuir lad mise ann an sèomat fuar (I am in a cold cell). Published by Marjorie Kennedy-Fraser in her extensive collection “Songs of the Hebrides” (1909) under the title: Sleeps the noon in the deep blue sky. Och nan och (Sad am I). An old historical lament written for the young Laird of Rassay, John Garbh MacLeod who was drowned in the Minch about 1659. Drunk at night and dry in the morning. A humorous title for a spirited 18 century violin melody. An Gille Ban (The Fairhaired Lad). The melody of a very old song of hopeless passion: she still loves him tho’ she fears that he has deceived her. Cailin’n Fhuilt Ban (The Fairhaired Girl). Another beautiful Gaelic air from the island of Lewis. Tir-Nan-Og (The Land of the ever young). This is the Celtic Heaven, situated somewhere in the ocean, far away to the west of the Hebrides. Also incorporated in this composition is the ancient waulking (working) song “Heman Dubh”, sung by the Hebridean women working at the tweed making. Anne Macdearmid wrote the piece as a tribute to Edward Witsenburg on his 60th birthday. The small village of Kirconnell is in Dumfries and Galloway. The sad tale of Helen who was killed by an arrow meant for her lover. After taking his revenge he laments his lost love. The poem can be found in Sir Walter Scott’s “Minstrelsy of the Scottish Borders” (1802-3). A combination of three elegant dances from the late 18th century: Mrs. John Clark’s Delight, Lady Elizabeth Cole’s Reel and Mrs. Roy of Nenthorn’s Favourite. A well-known and loved Highland lullaby. A mother soothes her weeping child: “Angus is here wi’dreams to sell, hush ye my baby and sleep without fear, Dream Angus has brought you a dream, my dear”. The Silver Moon my Mistress is. An ancient song lamenting the death of a beloved girl and a longing to be with her. This march refers to the private army of the Duke of Athole in Perthshire, the only person allowed to have this privilege in Britain and indeed in Europe. Oran nan Eilean (Music of the Islands). This piece is based on two Hebridean melodies: Long a Leumraich, an air from Harris, with the middle section based on an air from Eriskay, H-Eadaraibh a h-uinn O.
Och nan och, tha mi fo mhulad (Och, I am sad). A song of a Lewis exile, remembering his youth and his love for the island, with the final hope that he may return and find peace and rest. The arrangement has been specially written for two concert harps. Based on Bu chaombh bhi mire, a Gaelic courting song, followed by a strathspey (a Scottish dance characterized by its dotted rhythm), I dali u dali and finally a quicker reel, Null thar nan eileanan. Programme notes by Edward Witsenburg. With special thanks to Anne Macdearmid and Rachel Ann Morgan for their invaluable help and enthusiastic support.